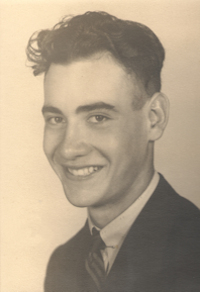 Obituary – Phenis, Harry Dale « Perry High School Alumni Association, Inc.
– son of Mr. and Mrs. H. R. Phenis, 630 Fir street, was born July 18, 1926, at Blackwell, and attended grade school in the rural districts before coming to Perry high school. A member of the Maroon band for four years, Dale plans on studying to become an electrician after graduation. 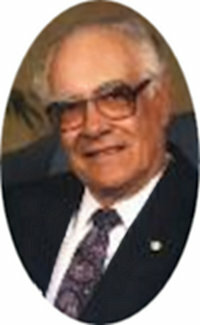 Dale Phenis was born on July 18, 1926 to Harry Raymond and Edna Mae (Burton) Phenis, in Blackwell, OK. He passed away on February 15, 2009, at his home in Hinton, OK at the age of 82. Dale graduated from Perry High School. He lived in Perry, OK, Edmond, OK, and The Village. He worked as a fireman for the Edmond Fire Department and The Village Fire Department, retiring as Chief in 1969. Dale moved to Cedar Lake in the mid 1970’s. He was united in marriage to Mary Jo Trumbla in August of 1945 in Perry, OK. He later married JoAnn Wyont in Edmond, OK in 1978. Dale was a handyman, working as an electrician and in construction. He was a member of the Hinton Masonic Lodge #313, Scottish Rite in Guthrie, and a charter member of the Cedar Lake Chapel. Dale enjoyed woodworking, loved to collect firefighter memorabilia, and singing. He was talented in playing several musical instruments. Dale was also a member and past chief of The Cedar Lake Fire Department. Survivors Include: Dale’s wife JoAnn of the home, four children: Robert L. Phenis and wife Linda; Dalann Covington and husband Don all of Beatrice, NE; David Phenis and wife Nicole of Manderville, LA; and Joy Elaine Smith of Saucier, MS; four step children: Sherry Van Gundy, Jana Wyont, and Robin Wyont and Randy Booker all of OKC,OK; Chris Wyont and wife Sheila of Forney, TX; 28 grandchildren, 24 great grandchildren, and 2 great great grandchildren. Dale was preceded in death by his parents, Harry and Edna Phenis, his sister, June Burger, and step son, Richard Wyont.